The original Douglas DC-4 was intended for the airline companies United Airlines and American Airlines. So it began test flying in 1939, but the USA joined in what was to become World War II and the production line was put to use to support the wareffort, Thus the first 24 C-54s were produced. The C-54 and its variants saw service with Air Forces around the globe and some still persist in a military role. 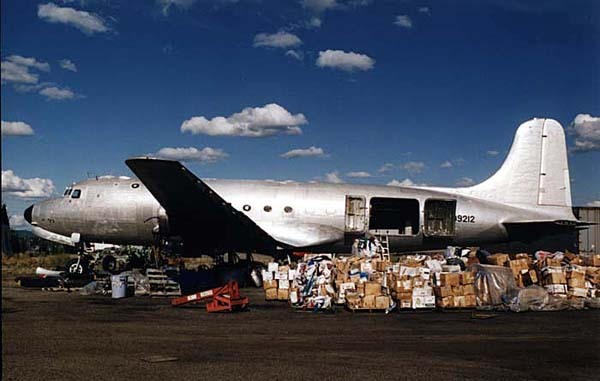 There are still DC-4s to be found that are being used commercially. But their numbers are getting smaller and smaller. In the USA quite a few have been reconfigured to airtankers, to fight forest fires, but many are stored in some corner of the airport, as supply for spare parts or await an uncertain future, parked somewhere in the desert. It did not look for the better when I saw it in 2003 ! 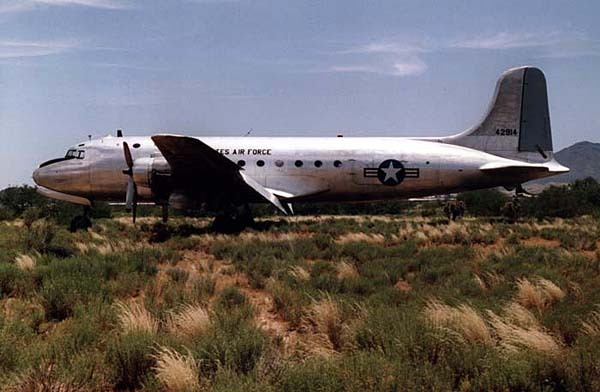 C-54D N67062 (c/n 10741) of Central Air Services seen here stored in the desert, at Avra Valley, Arizona. I took this photo in june 1993 and was optimistic on its chances to fly again at that time. But it was never called back to action as an airtanker. Instead it remained stored and went airborne again after many years when it was ferried on Jan. 19th 2002 (!) to March Field Air Museum in California. This tired workhorse was delivered brandnew from the Douglas factory to the USAAF on May 31st, 1945 (serial 42-72636) and was transferred to the US Navy that same date; it was redesignated from C-54D to R5D-3 with registration (BuNo) 56514. And again redesignated C-54Q in 1962. It's military activities ceased when it was stored at Davis-Monthan AFB, AZ in Oct.1965. The Texas Truck Salvage Company bought it on Feb.21st 1975, but was again reregistered to Robert B. Audiss on April 3rd 1973 and was assigned its tailnumber N67062. Bill Dempsay / Central Air Services bought it on Oct.11th 1976 and thus started its airtanker life, carrying "148" proudly on the tailfin. That too ended, in 1994. Now it's going to be preserved and that's the next best thing ! And then, on August 08th 2002, almost 10 years later, it made a 10-mins. testflight ! While acquired by Aces High Inc (a Delaware corporation, representing Aces High -UK) together with N44914, it was to participate in a tv film about the Berlin Airlift. N31356 crossed the Atlantic (not without some technical delay) and arrived at North Weald in the UK on 28Sep02. 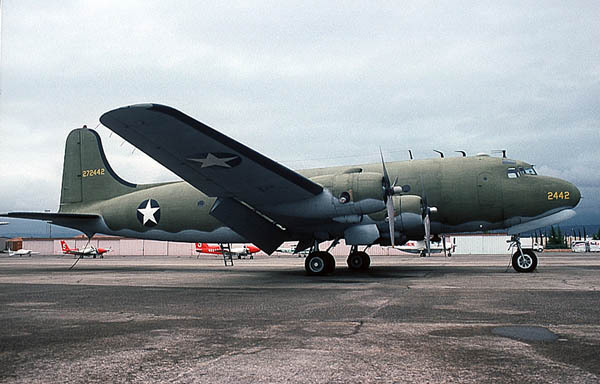 This Douglas C-54D N4994H (c/n 10653) has been put aside by Aero Union for spares. Aero Union is located at Chico, California and has built an impressive reputation in reconfiguring transports like the DC-4 to airtankers. This old propliner started life in 1945 when it was delivered to the USAAF and it was stored by the military in 1971. Aero Union bought it in 1978. I took this shot in 1996 when it was for sale. It does not look like it, but it did find a new owner: Buffalo Airways bought it in 2000 and flew it in November 2001 to Canada ! It was reported at Red Deer, Alberta in Apr02 as C-FBAA. C-54D (c/n 10547) was delivered to the USAAF 31jan45 as 42-72442, but the warpaint this one is carrying was applied for a movie. This tired transport was transferred to the RAF in 1945 and the next year it was put to use by the US Navy (BuNo. 91994). It was converted to C-54Q. In 1970 it was stored in the desert of Arizona, on Davis Monthan AFB (MASDC, later AMARC). Aero Union bought it in 1974 and registered it as N62296 and reregistered it as N76AU "Spirit of America". And if you need a C-54 in the background while shooting a movie, this could be a good prop (pun intended...). Well, it was when I took this photograph at Chico,CA 17may95. Aero Flite Inc., of Kingman,AZ had a better idea and bought it in 1999. It was ferried to Kingman and recent reports (Oct. 2001) have reported work been done on the aircraft and painted in the colours of Aero Flite. It will be their third DC-4 and no doubt will also be used in the airtanker role, fighting fires. A new lease on life, great ! 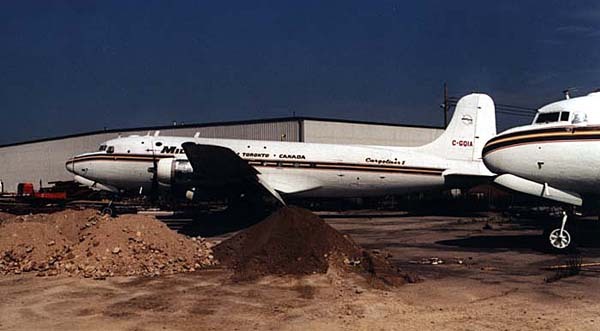 Millardair ceased flying and stored this Douglas C-54B C-GQIA (c/n 10464) at Toronto IAP in 1995. It was delivered to the USAAF 02dec44 as 42-72359. It was registered as N48165 in 1974 and Millardair bought it 24may76. I shot this photo in 1998 but it was still reported as stored in may 2000. The C-54D on the right is C-GDWZ (c/n 10636). Carl Millard died on 28Nov06., age 93. It wasn't that Carl Millard was a curmudgeon "but he realized you couldn't be a wimp and run an airline," says aviation author and publisher Larry Milberry. "He had his own way of doing things. Not everybody loved him but they were the ones who couldn't meet his standards. Millard was born at his father's farm near Ingersoll, Ont., Nov. 28, 1913, only 10 years after the Wright brothers first flew. At 15, he was inspired to fly when a bright-red plane flew over the field he was ploughing. Terence Tully and James Medcalfe were trying to make the first flight from London, Ont., to London, England. They disappeared in mid-Atlantic but they'd sown a seed in Millard's mind. He bought and rebuilt a dilapidated plane and was taught to fly by a former World War I fighter pilot. Millard was the 46th pilot hired by Trans-Canada Airlines, the forerunner of Air Canada. He formed his own company, Millardair, in 1963, with a fleet of 20 aircraft. He also built a reputation for butting heads with Transport Canada over the aging DC3 and DC4 propeller-driven cargo planes he insisted on flying right into the jet age. The young pilots and mechanics hired by Millard didn't earn much money at first. If they couldn't afford lodgings, they'd bunk down in the hangar. "His love was 'piston-pounding'-planes," said Milberry. "Flying was in his bones. It wasn't just a job. These old planes were as safe as anything else but Transport Canada was always on his case. It was an ongoing dogfight but Carl beat them." His son Wayne recalled two Royal Canadian Air Force DC3s being sold in Scotland in the 1960s. "Dad figured they were worth $75,000 each. But he said, 'I'll bid $25,000 each and hope everyone else is scared to fly the Atlantic in them.' It worked! The two of us brought them back, refuelling in Iceland and Greenland. They became the backbone of the business." The airline still exists in name but hasn't flown in about 10 years, Wayne said. "We own the hangars and Dad decided there was more money in being in the hangarage business. Up to a few months ago, he was coming in every day for a couple of hours, just to make sure everything was running right." Yes, this one started as a DC-4 Skymaster...! In fact it operated with some well-known airlines: Scandinavian Airlines System (LN-IAE), Japan Air Lines (JA6012), Korean Airlines (HL4003) and Ansett Australia (VH-INK). 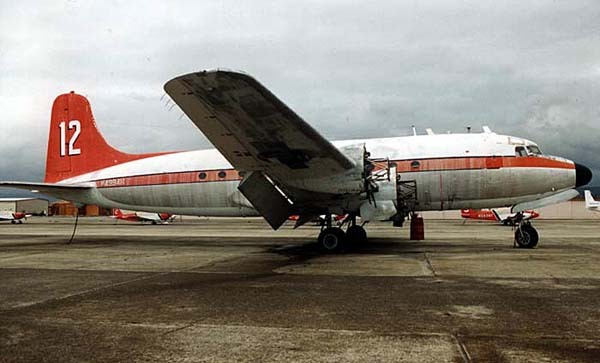 It was bought by Aviation Traders (England) and rebuilt to ATL-98 Carvair. On this photo you can see quite easily that it was reconfigured to a nose-loading freighter. A unique and impressive job, originally designed for cross-Channel vehicle ferry services. As such, this particular aircraft (DC-4 c/n 42994, ATL-98 c/n 20) went to interesting places. As N5459X it operated with Hawaii Pacific Air from Honolulu and it was reregistered to C-GAAH for Hawkair in 1997. 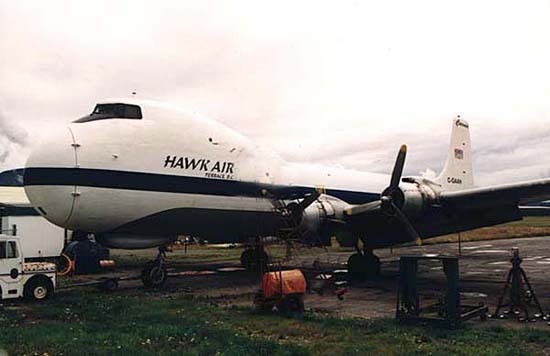 Hawkair operates from Terrace in British Columbia, Canada (quite a remote place). The Carvair was used on a contract with Homestake Canada Inc to transport gold ore mined from the Snip Mine, picking up the cargo from Bronson Creek airstrip and making a 25 mins. airtrip to Wrangell, where the cargo was shipped to Japan for processing. 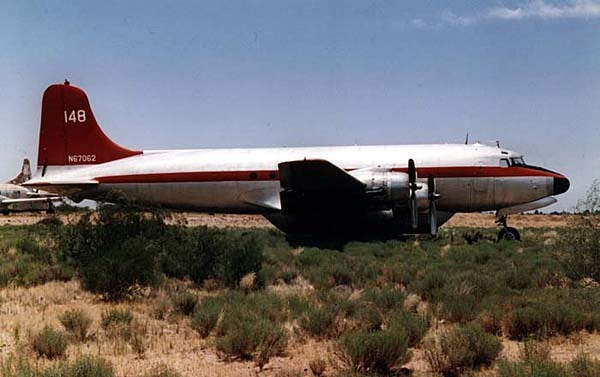 When the mine shut down in may 1999, it was the end for the Carvair (and almost for Hawkair, for that matter) and it was put up for sale, for usd 350.000. There are only 3 (of a total 21 converted) airworthy Carvairs left in this world, one (N5459M, c/n 21) last reported in South Africa and one (N89FA, c/n 9) at Griffin, Georgia, USA. C-GAAH remained stored at Terrace,B.C. for a number of years, but it was bought by Brooks Fuel of Fairbanks in Alaska and flown to Fairbanks in Dec02. Brooks restored it to full airworthiness and started operating it in 2004. Have a look at how I found it in 2003. Gil White wrote an excellent history on this unique aircraft. Piston Engine Airliner Production List (1991) by A.B Eastwood & J.Roach (published by TAHS).